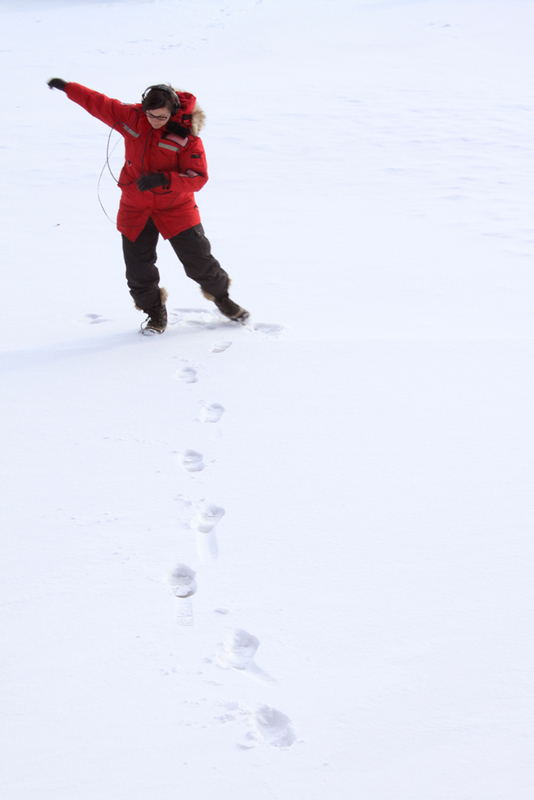 Snow Pants Dance is a playful audio piece responding to the swishing and crunching noises made when moving in snowsuits and other winter clothing. A zoom audio recorder was placed in the pocket of the parka and contact microphones were attached to my body inside the parka. I improvised a dance in the snow, responding to the sounds made by the parka and the crunching snow beneath me. Aside from a few photographs there is no visual documentation of this dance, and there was no public present to view the performance. The only temporal documentation of the performance is the audio recording. This too is a look at how we often prioritize the visual when it comes to choreographing and documenting performance work. This was a dance work deliberately created for sound. Never to be seen, only to be heard.